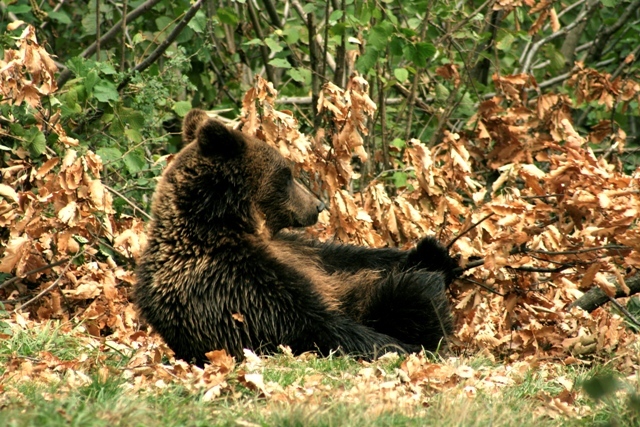 Nikki Cole kindly shares her experience of volunteering with bears in Romania. “After my previous week away animal volunteering abroad, I was completely ready for another placement and to book another week off for more animal volunteering. I found a volunteer opportunity for a bear sanctuary in Romania online, and what really struck me was how well it looked like the bears were cared for. Unlike some places, their welfare really was absolute top priority, no tricks or gimics for the public, just beautiful wilderness enclosures where the bears can have everything they need and are entitled too, but have always been denied in their previous abusive homes. They are all rescue bears, rescued from many horrible, upsetting situations such as circuses, poor quality zoos and even outside shops and restaurants as a sad tourist attraction. My favourite bear, Max, was rescued by someone who abused him, made him blind and used him as a tourist attraction. After inquiring and hearing from a previous volunteer, I was quick to book. Part of the cost of the placement includes a donation to the sanctuary and I really wanted to help by volunteering. So I arrived on the Friday, we then had the weekend to enjoy before volunteering all week, then going home. On Saturday, we were taken to the bear sanctuary to be shown around before volunteering. And I fell in love with the place! Around the mountains with lots of beautiful views, the best of all of course being the sight of all the bears, happy and with their every needs catered for! I met Max, my favourite bear, and was shown a video of him when he first discovered the water and was taking his first dip. It was very moving after his upsetting story, a bear who had known nothing but abuse now living like a bear should-with a good diet, a big pool of water and lots of wilderness and tunnels and dens. We also met a bear who had previously been a circus bear, and was now free from having to perform and flip for her next meal. I walked around, the whole place was really beautiful. It was a beautiful perfect home for the eighty plus rescued bears and also a small pack of rescue wolves, rescue donkeys and a lot of dogs! So we got taken back to our accommodation, and us volunteers cable cared up to the big Brasov sign and took a long trek back down! After visiting Dracula’s castle on Sunday, it was time to volunteer. As a volunteer, we had lots of privileges, we could walk around the sanctuary as we pleased, many dogs in toe, and observe the bears. There were lots of photo opportunities, and there was also huge steps with a high up lookout point where you can get a great view of the sanctuary and the bears and take lots of photos. It was up here that I had the highlight of my week, seeing Max get into the water and have a long bathe! He scrubbed himself with some shrubs too and lay back, orange in hand, the ultimate chilling pose! Next door was a bear up a tree! Opposite was one bear, enjoying the peace next to his pool. We also had a cute bear follower, part of the volunteering was gardening, maintaining the areas around the enclosure, raking up the leaves and one bear took it upon himself to ‘help’ getting whatever wood he could find and taking it apart, as if he was trying to work too! Or he would supervise just watching us and following us around. And if he wasn’t supervising, the many dogs of the sanctuary were keeping us company, I was very, very happy to not be short on dog companions. I love the bear sanctuary. Their welfare really was number one, top priority, possibly the best place I’d ever seen for that matter. They have the public in, but not going around as they please just for guided tours, which the volunteers can help with. This is nice, because after what the bears have been through there is not too much exposure to the public and its as much like the wild as possible. Where they can’t be released back into the wild, because they wouldn’t survive, the sanctuary is doing the next best thing. If you would like to follow in Nikki’s foot steps and volunteer with the bears then check out our website.